The scores should be formatted so when it is a whole number no decimal places are shown. When the score has a half point, it should be shown to 1 decimal place. Ok, not too bad! They layout itself was pretty simple. It's just squares. To color them separately, since there is only one Score field, I created two calculations. I made both of them discrete dimensions and assigned the colors using the color picker to choose the colors from Emma's viz. 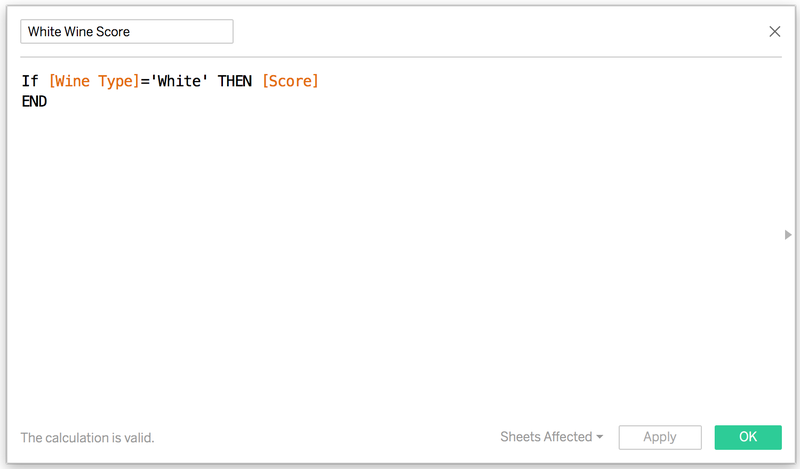 I then duplicated both of them and assigned alias names to use for the color legend of each chart. 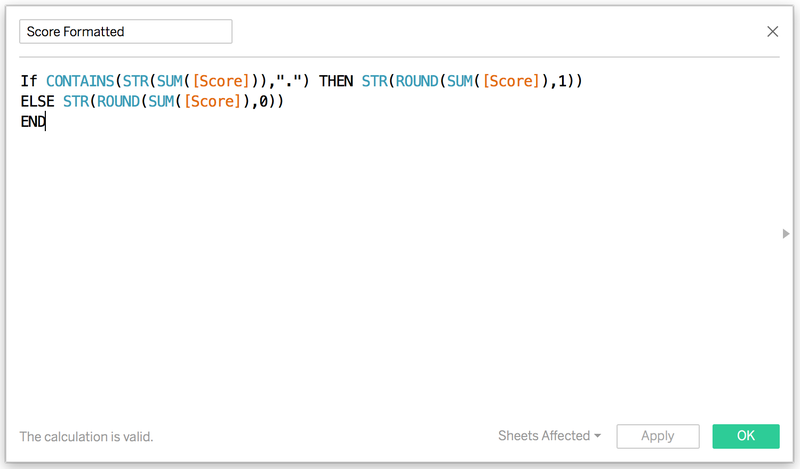 For the score formatting, all I did was create a simple calculation that first summarizes the score, then changes it to a string, then determines if it has a decimal and if so, return it rounded to one decimal and converted to a string, otherwise return it rounded to zero decimals and convert it to a string. I'm going to have to download Emma's version to see how she did it. We tend to take very different approaches. With that, here's my Workout Wednesday Week 22. Click on the image for the interactive version. Makeover Monday: How Has Internet Access Changed Around the World? UPDATE: Thank you to Jamie Briggs for pointing out that I shouldn't have used the average internet users for the worldwide figures. I have changed it to a weighted average by year by including population stats for each country for each year. For #MakeoverMonday week 22, Eva picked an interactive map from Knoema that shows internet access over time. Providing the context of "per 100 people"
Include a more engaging title. Stoplight colors work ok for me, but not for the color-blind folks. The color scale in this case makes anything below 75% look bad. Is that really the case? Isn't providing more access over the years more important? Why are years without data included on the timeline? Having to flick through the years prevents you from seeing the change over time. With that, here's my Makeover Monday week 22 creation. Enjoy! 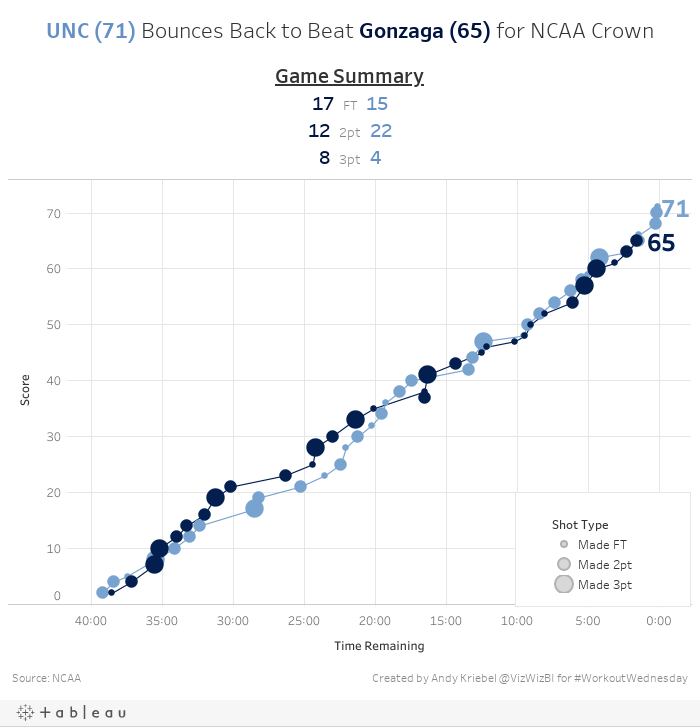 For Workout Wednesday week 21, we look back at an epic NCAA final between North Carolina and Gonzaga. Download the data here. I think that's it, but if I missed a requirement, let me know and I'll update this post. Good luck! This week's tip is a demonstration of how Eva Murray created the dashed lines in her Makeover Monday week 21 viz. In this video, I demonstrate Eva's method (via table calcs) as well as the way that I'd always done them with the Pages Shelf. 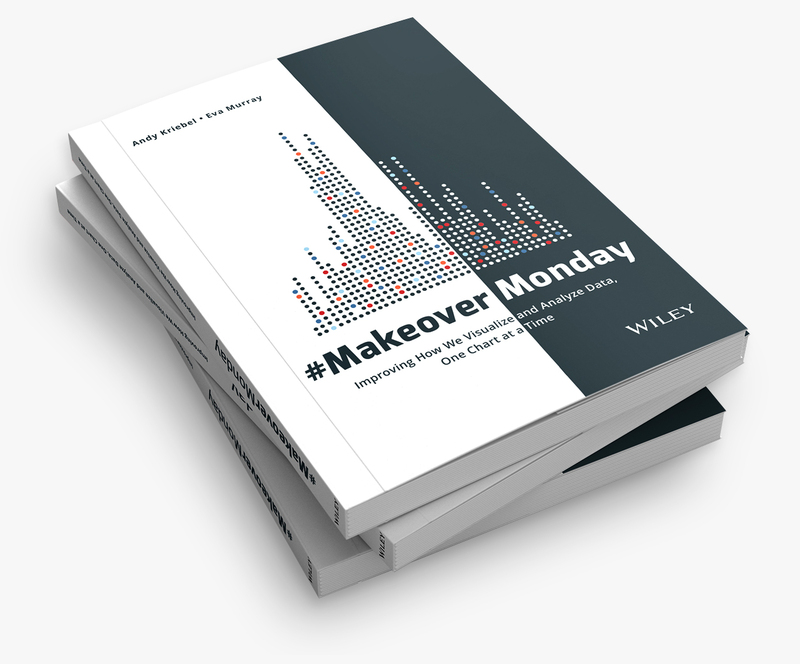 Makeover Monday: How has alcohol consumption in Britain changed since 2005? 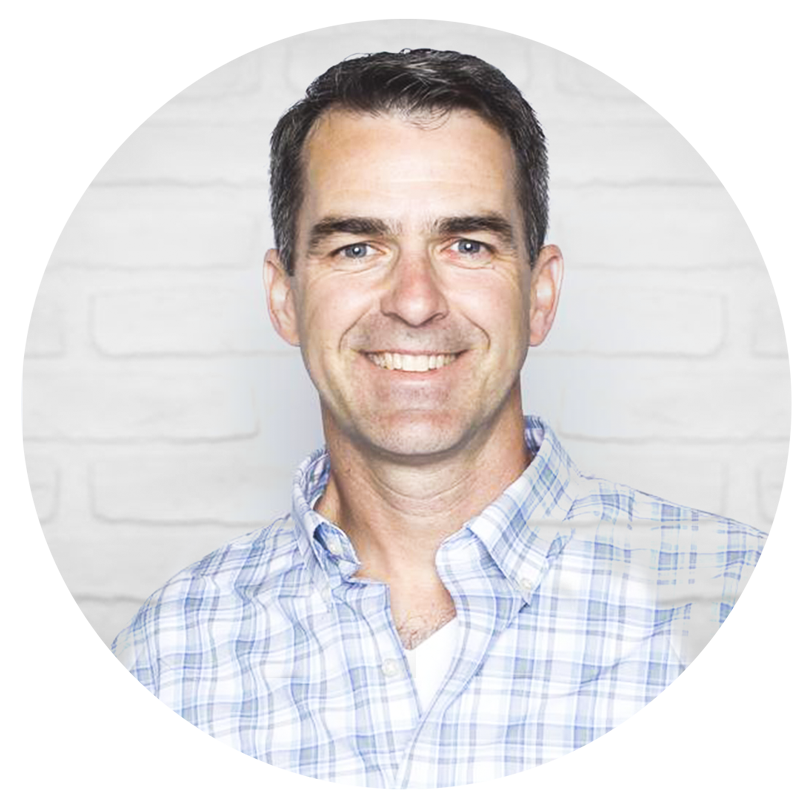 This week we're taking Makeover Monday on the road to the Paris Tableau User Group. The French and the British have always had a "special" relationship, so this week I thought we'd make the TUG more fun by letting the French make a bit of fun on the Brits. 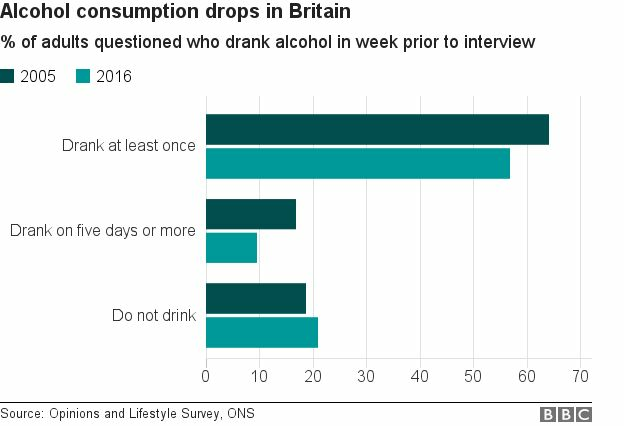 A couple weeks ago, BBC Health published this simple viz about the change in drinking habits in the UK between 2015 and 2016. This is a very narrow view of the data, whereas there are many more years available and it's also available by gender. It's a pretty boring viz; one that you'll often skim by and not engaged with. For my viz, I knew I wanted to use male, female and all people plus all years. 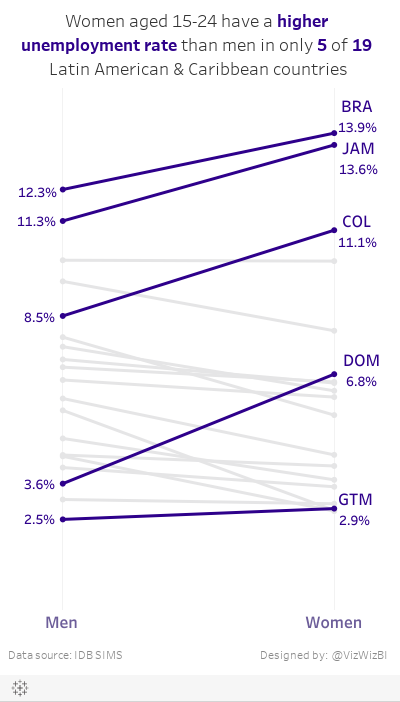 This removes a bar chart as an option, preferring lines to show the trends since 2005. In addition, I wanted to show change since 2005 to provide better context that matches the purpose of the title. 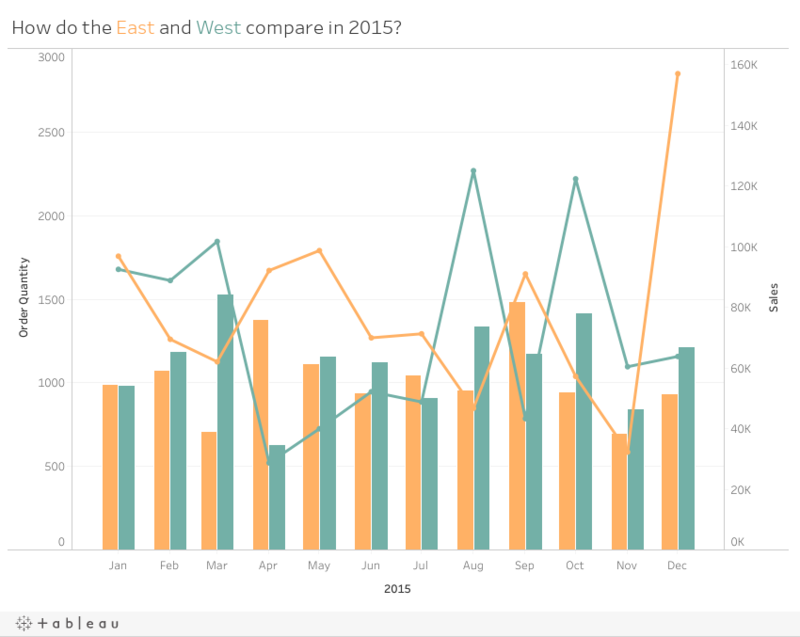 I drew inspiration from this European IronViz entry by Ravi Mistry. I like how he is showing the change since the beginning. Unlike Ravi, though, I decide to only label the line for all persons. I made this decision because labeling the end of each line would have made the viz feel crowded, as the numbers are varying enough to provide room to breathe. 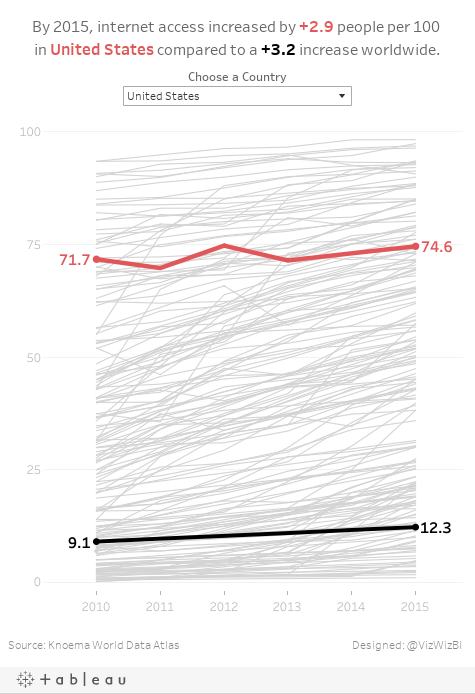 I wanted to test out the Inconsolata font that Nathan Yau uses for his charts over on Flowing Data. If you have it installed on your computer, you'll see my intended display. If not, Tableau Public will server up something, not sure what really. Lastly, the colors. I picked them from the ONS dashboard about the UK economy. Click on the image below for the interactive version. Today at The Data School we took on Emma's Workout Wednesday challenge as a group, brainstorming along the way until we came up with a solution. We decided to take on Jeffrey's challenge for a bit more complexity. This week's tip came from a question reader Jonathan Hayter sent me. I want to show one decimal point on the value of my mark labels -- except when the digit following the decimal point is zero. So, in the example below, I'd like to make the label for 2013 show as "57%" rather than "57.0%." Great question! I told Jonathan that I disagree with formatting the numbers differently, but I also wanted to help him find a solution. The answer is two calculations and the modulo function. In the final version you see below I've included a third calculation to highlight the bars that a zero following the decimal point. This is merely to make it easier for you to see. I didn't show this in the video. Download the workbook to see the solution. 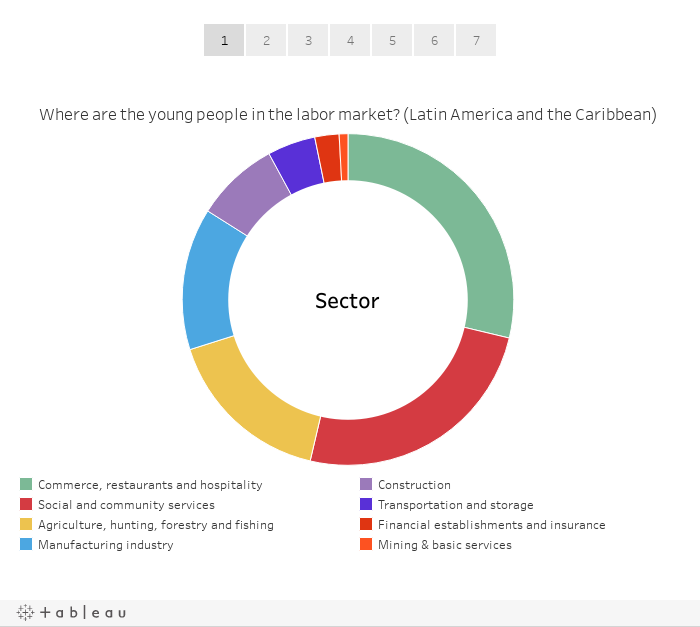 Makeover Monday: What jobs do young people in Latin America hold? Today is a pretty big day for me and for Makeover Monday. For me, this blog post is my 800th since I started writing way back in August 2009. You might not care much about that, but for me it feels like a nice sense of accomplishment. For Makeover Monday, this week is a collaboration with #VizForSocialGood and Inter-American Development Bank. It's always a special day when you can make an impact. Eva and I are also hosting a Brightalk webinar about Makeover Monday at 4pm BST today. Join us if you have a chance. 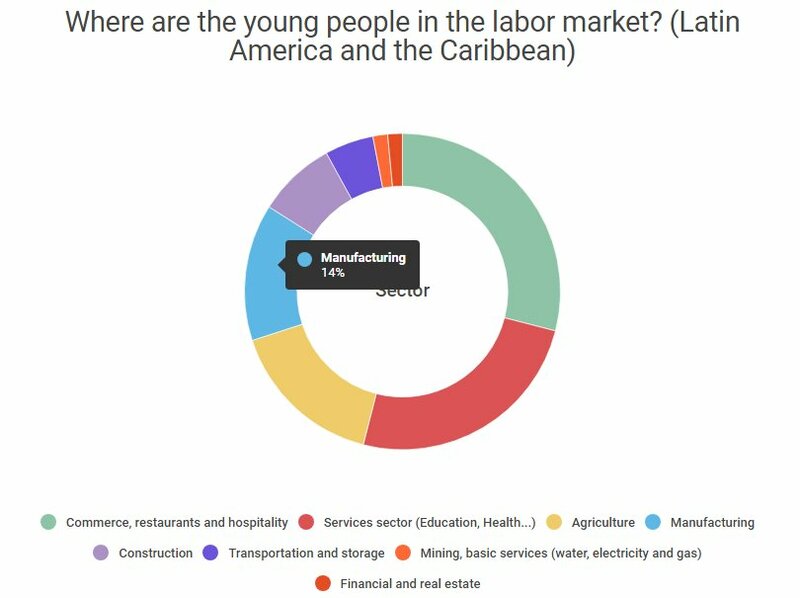 This week's makeover is a donut chart that shows how many youths in Latin America and the Caribbean are employed in different jobs. Why are mining and basic services combined? The middle of the donut is wasted. The data doesn't tell an effective story. A bar chart would make comparing the sizes easier than a donut chart. 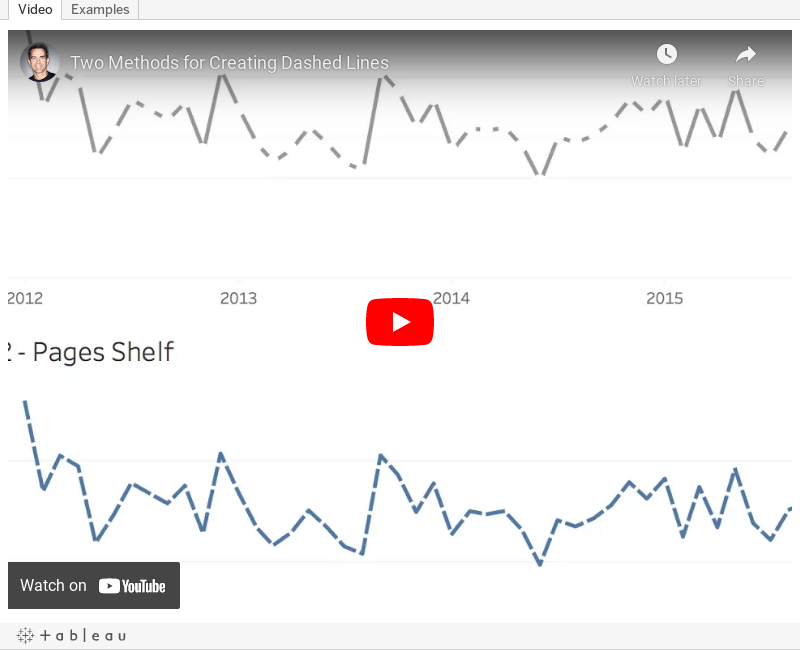 For my viz, I decided to start by recreating the original in Tableau and then using story points to walk through each step of my makeover. I recalled this great post by Cole Nussbaumer in which she presents alternatives to pie charts. In particular I really like her big number viz, so I did my best to emulate that style. Simple and more effective that the donut chart for me. Workout Wednesday week 19 builds upon the challenge from week 17, so if you haven't done that one yet, don't worry. Many of the requirements of that challenge are repeated in this challenge. CAUTION: This took me the better part of two days to figure out. Don't let that scare you though; I'm fairly sure there's a much simpler way that I missed because I got so deep into it. Include a summary table at the top right that shows the number and % of products that sell in each region. 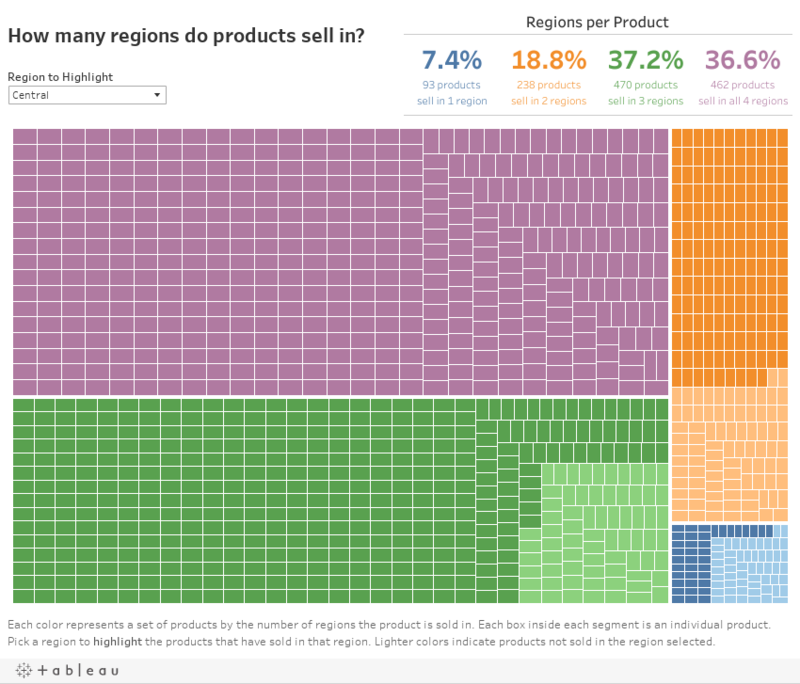 Match the tooltips in the treemap. 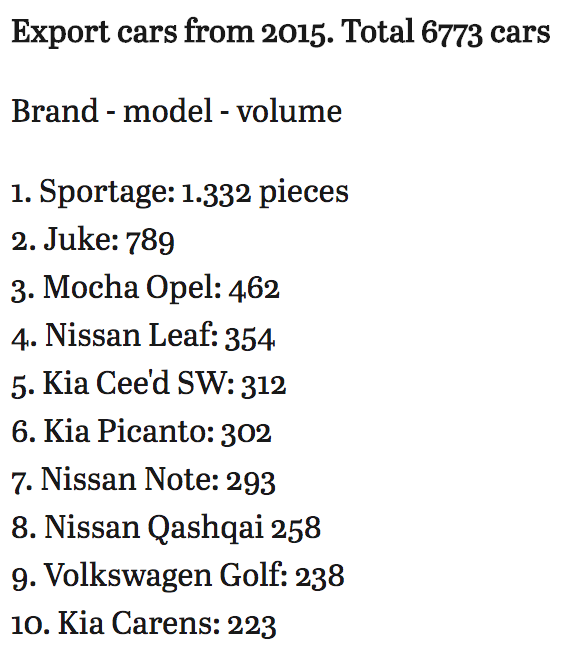 NOTE: The tooltip contains a list of the regions that each product sells in. 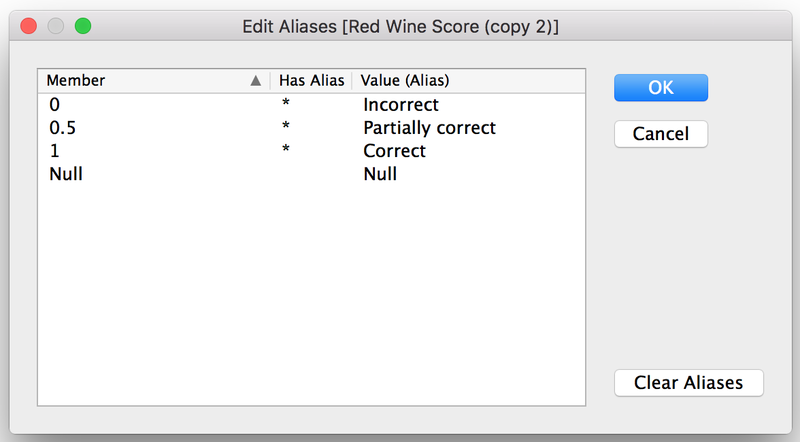 Create a parameter that includes the list of regions and it should highlight the products that sell in the selected region. Products that do not sell in the selected region should be the same color as the segment, but a lighter shade. Match the caption on the treemap. Remember to post a picture on Twitter with the hashtag #WorkoutWednesday and tag me (@VizWizBI) and Emma (@EmmaWhyte). Good luck! 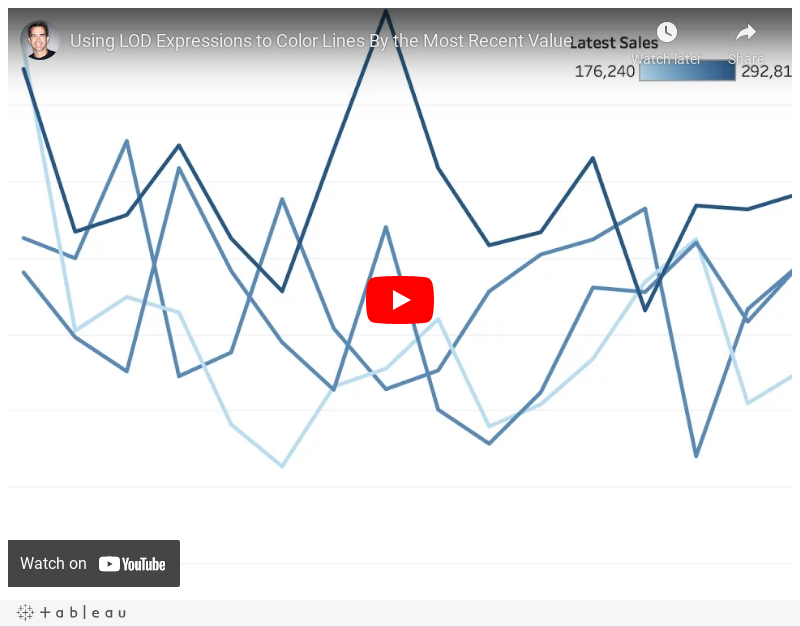 How can I color each line on a line chart by the most recent value? 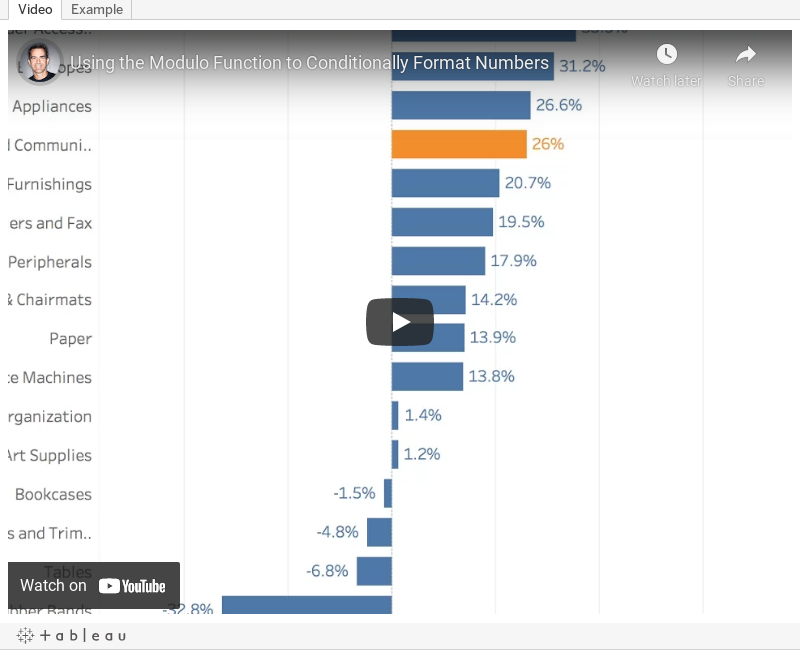 Tableau calculates the inside LOD first. Then the second LOD is calculated based on the results of the first LOD. Then the third LOD is calculated based on the results of the second LOD. Make sense? I hope so! If not, let me know. Enjoy!